The year 2017 marks the 90th anniversary of the foundation of Kawai Pianos, The latest CS-Series digitals (launched at Musikmesse 2016) reflect those decades of experience in crafting acoustic grand pianos. The Grand Feel II action has long wooden keys. Wood is unique in its ability to absorb energy and to flex slightly when compressed, enabling the key to meet the felt keybed with a natural stop rather than a disconcerting halt. The wood also enables the feedback of subtle vibrations to the fingers, similar to an acoustic instrument. Having the same pivot length as grand piano keys maximises the realism of the experience, enhanced further by the ‘Ivory & Ebony Touch’ key surfaces. The relationship between touch and tone is inextricable. The CS8’s selection of three premium grand pianos harnesses the precision of the action. The two 9ft concert grand samples from the CA17 sound even better on the CS8, with its superior six-speaker, 50 watt-per-channel sound system. 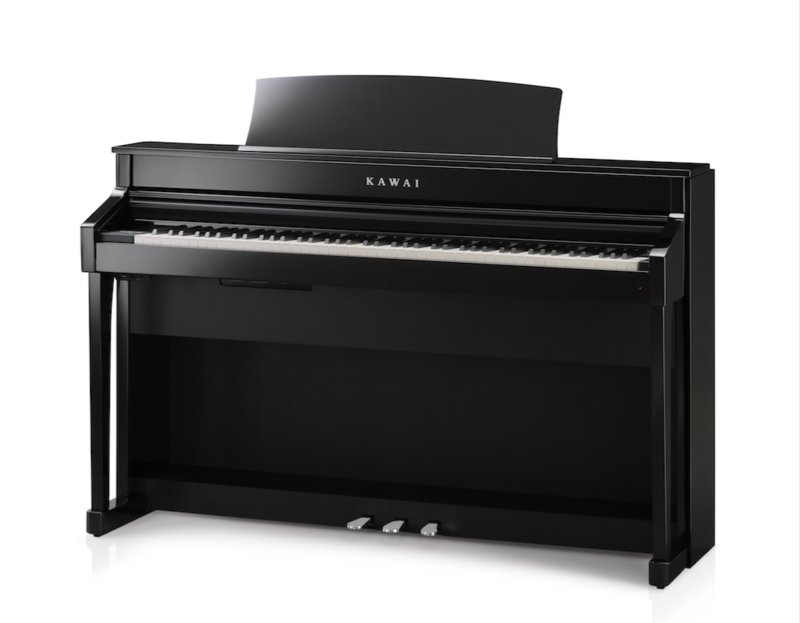 Kawai has added a high quality sample of the artisan-crafted Shigeru Kawai SK-5 6ft 7in chamber grand to widen the choice, alongside a strong range of other sounds, including an upright piano sample. Headphone users will benefit from an audiophile quality headphone amplifier and Spatial Headphone Sound technology, which enhances depth and realism and reduces listening fatigue. These features should inspire pride in any owner of a Kawai CS8 piano. Further flexibility of use is gained through digital functions such as USB audio recording and playback, lesson and finger exercises, and several keyboard modes including Four Hands.